Published Sep 13, 2011 by Peachpit Press. Part of the Video QuickStart series. Visual QuickStart Guides are now even more visual: Building on the success of the top-selling Visual QuickStart Guide books, Peachpit now offers Video QuickStarts. 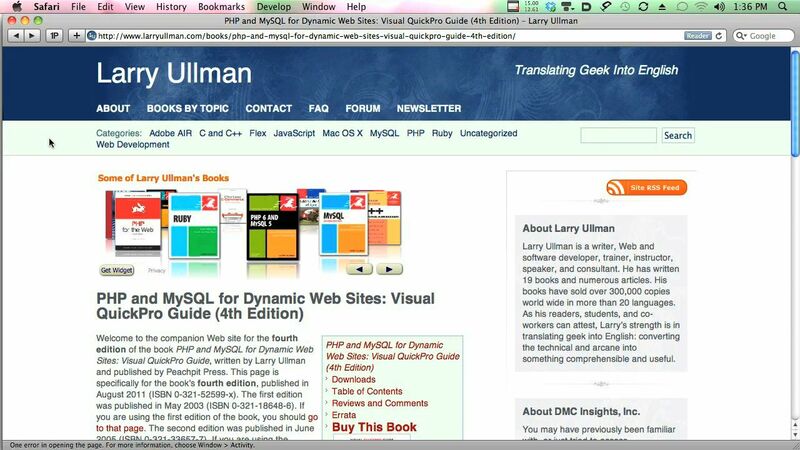 As a companion to his book PHP and MySQL for Dynamic Web Sites: Visual QuickPro Guide, Fourth Edition (Peachpit Press, 2012), bestselling author Larry Ullman offers more than 90 minutes of short, task-based videos that will help you master techniques he describes in the book; instead of just reading about how to combine the PHP scripting language with the MySQL database application, you can watch the author in action. It’s a great way to learn the basics and some of the newer or more complex PHP and MySQL techniques, including handling an HTML form, accessing a MySQL database server, paginating query results, debugging, handling file uploads, using jQuery, and more. This video will have you up and running with PHP and MySQL in no time. Log on to the Peachpit site at www.peachpit.com/register to register your book (using its ISBN number, 0321784073), and you’ll find a free streaming sample; purchasing the rest of the material is quick and easy.